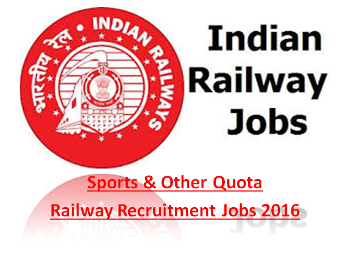 Indian Railways under Ministry of Railways has issued various notifications of Railway Recruitment for Sports and Other Quota Jobs& various other jobs in the month of October 2016. Candidates who are desirous to apply for Railway Jobs under Sports and Other Quota or other jobs can apply. This is a golden opportunity for candidates falling under Sports Quota or Other Quota as Railway Recruitment is seeking candidates falling under the mention categories. Not only quota-wise recruitment, railway regional bodies have vacancies for other posts too. Railway Recruitment bodies like: East Central Railway, North Central Railway, Eastern Railway and other regional bodies are hiring aspiring candidates who meet the kept eligibility criteria for the posts by the ministry. All the interested and eligible candidates who are willing to join Indian Railways can apply through the prescribed format along with required documents on or before the last date of application. Government Jobs are most desiring for individuals and attaining a Railway Job adds on to the store of luck. So, here now you can apply for the vacant posts under Railway Recruitment 2016 on or before the last date of application.